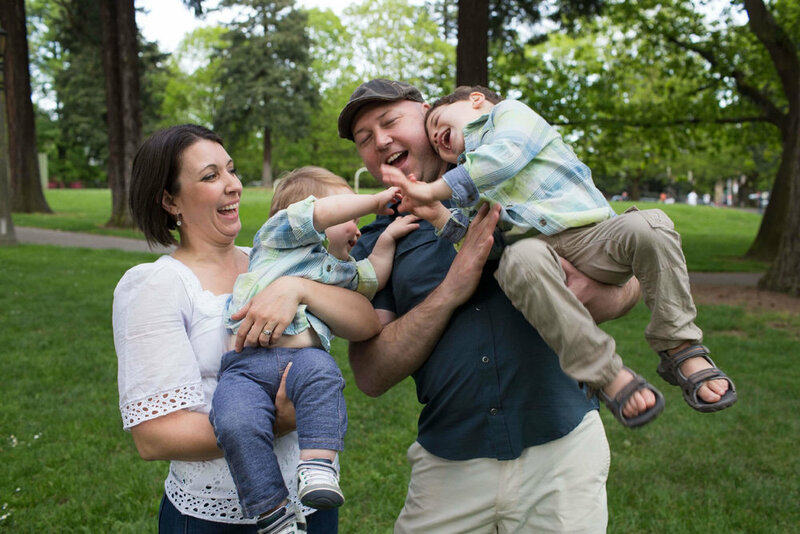 Jessica and Chris Wade with their two boys, who are the inspiration for The Wiggle Room. 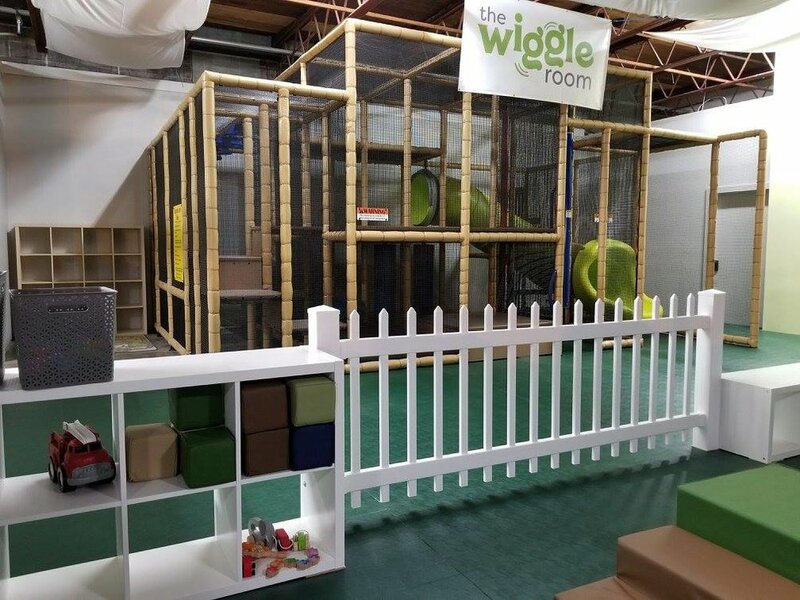 The Wiggle Room is a 2,000 SF indoor play space located in the heart Of NE Portland's Hollywood District. We enjoy transforming dreams into reality, simply for the joy we feel when we see and hear our children's smiles and laughter. We look forward to bringing smiles and laughter to your family too. The Wiggle Room is a play space in NE Portland Hollywood district designed and owned by a local, experienced and licensed pediatric occupational therapist, Jessica Wade. Jessica has 15 years of experience, in rehabilitation at hospitals in Philadelphia and Randall Children's Hospital, as well as educational experience in early childhood development with a local school district. The indoor play space is a 2,000 square foot space and includes a dedicated safe, padded floor for your little ones to enjoy, and a 16' x 20' play structure. It is not only fun for kids, but aesthetically pleasing and not over stimulating to the eye (welcoming to kids with special needs and sensory challenges). Slides, swings, padded blocks, toys and brain-engaging fine motor activities will provide hours of entertainment. If your child is an independent play expert that socializes well with others, you're welcome to sit at the bench seating overlooking the play area. Plug into power, connect to the free wifi, and relax or work with the peace of mind that your child is in a safe and secure environment. Snacks and beverages are offered so play can continue unabated! Looking for a safe and fun space to host a child's birthday? The Wiggle Room rents the entire space after hours so your party can have exclusive access to the play area, and staffed bar to serve your adult guests. The Wiggle Room is unique in its design and intention. We want children and adults to feel comfortable and at their best. Thus, one of the greatest compliments we hear is: Your space is very well thought out. It’s in the feel and the details. And it’s true! We have consciously combined many different elements to bring The Wiggle Room to life. Starting from the top, we simulated sunlight by trading the harsh fluorescent lighting for 5,000 Kelvin LED bulbs. Plus, we made sure to bring in as much natural light as possible by selecting a space with floor to ceiling, South facing windows. Next up, we draped white sheets (that move with the HVAC) from the ceiling to suggest clouds and absorb sound. In keeping with our natural, sensory-friendly priorities, we chose muted wall colors, earth tone and recycled plastic toys, and a grass-green padded floor mat. We are also thoughtful about sonic stimulation; our classical music playlist enriches little brains without overtaking the play. All these choices, combined with all the time we spend here with our own children, make this place a true extension of our home. We welcome you to come experience The Wiggle Room!